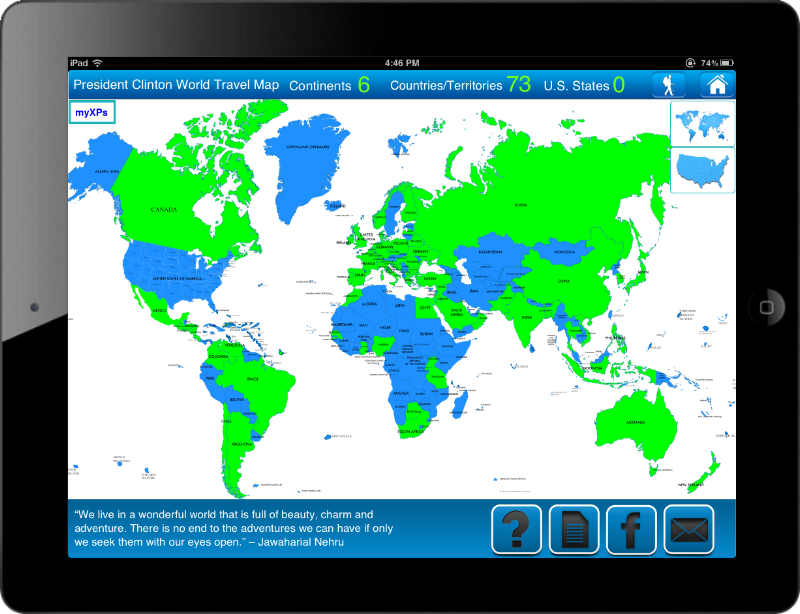 Travel Goal Getter's iPad App Enables Users to Track States Visited, Countries Visited, and Continents Visited & Travel Goal Getter's All Fifty Club, Traveler's Country Club, and Continent Club Fosters Travel Achievement Recognition and Celebration. 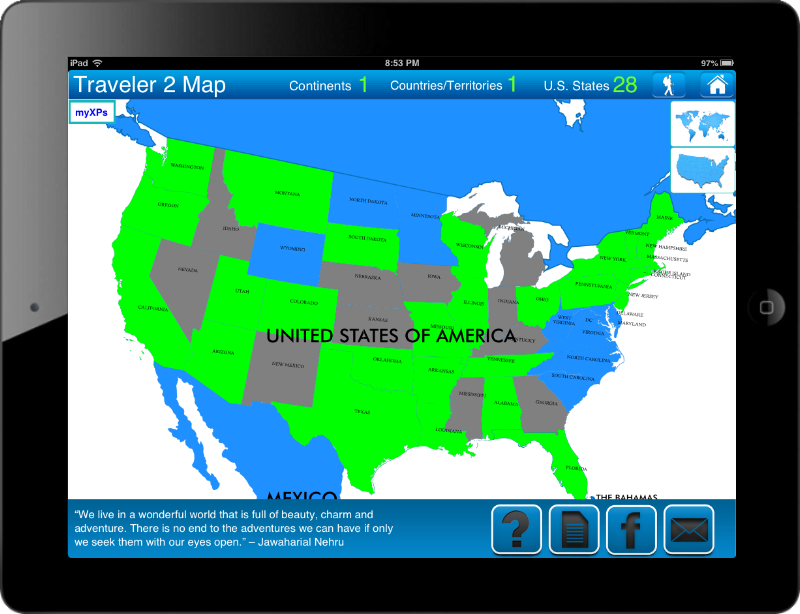 Nov. 29, 2012 - PRLog -- Travel Goal Getter LLC has announced the successful launch of the Travel Goal Getter iPad App that assists travelers in the tracking of travel goals and achievements on an interactive map of the world. In addition, Travel Goal Getter is pleased to announce surpassing 650 members in the All Fifty Club, Traveler’s Country Club, and Continent Club. The All Fifty Club recognizes travelers who have visited 35 or more US States, the Traveler’s Country Club recognizes international travelers who have visited 15 or more countries, and the Continent Club recognizes world travelers who have visited six of the seven continents. “We are very pleased with the response in the world travel community and our quickly growing user and membership base is a testament to the need for an easy way to track travel goals and to celebrate travel achievements,” says co-founder, Eric Prior. Travel Goal Getter’s All Fifty Club was recently recognized by one of the world’s top travel blogs, Gadling.com. In an October 29, 2012, post on this travel blog, Chris Owen writes, "The All Fifty Club is about as close as we can find to a governing, official organization charged with validating traveler claims of visiting all the states in America." 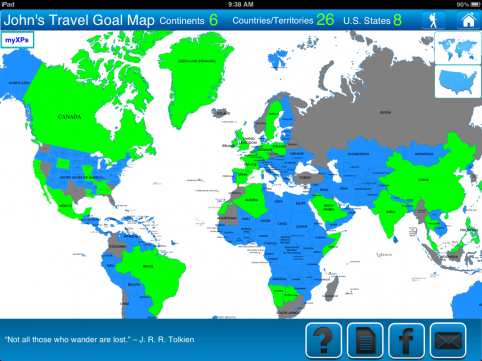 The Travel Goal Getter iPad App, available in the App Store, helps travelers keep track of travel goals and achievements. As an added value, the app includes a feature called My Experiences that helps users track the completion of bucket-list goals and travel experiences. Enhancements to the app are currently in development, which will add additional areas to the world map that are geographically, politically, or ethnologically different. This is the first of several free updates planned over the next few months to add a total of 77 new areas to the interactive world map, bringing the total to 321. This update will enable users to mark additional areas of the world with the goal of creating a more unique and individualized experience. Travel Goal Getter’s membership clubs were created to help travelers share and celebrate milestone travel achievements. Membership is available to travelers all over the world to recognize people who have visited all the states in the US, 15 or more countries, or at least 6 continents. “We have found the stories of travel achievements by our members both compelling and inspiring,” explains Prior. The Travel Goal Getter blog highlights several of these members’ stories such as Al Whitney, who has donated blood in every US State, and Harry Scott, who at age 78 played 50 rounds of golf in 50 states in 50 days. Travel Goal Getter is a family-owned company founded March 2012 in Cheyenne, Wyoming, Nashville, Tennessee, and Scottsdale, Arizona. The company focuses on helping travelers across the world by encouraging the tracking, sharing, and celebration of travel goals and achievements.